The line was set with a crossbow shot around a 3 foot diameter candleabra limb at about 100 feet. This kind of branch attachment is a type of secondary leader that grows at a 90 degree angle from the trunk, then turns straight upward, forming a co dominant. Once arriving underneath it, it blocked upward progress, like a ceiling. It was quite an operation throwing past it. Using a throwball in a tree is an art. 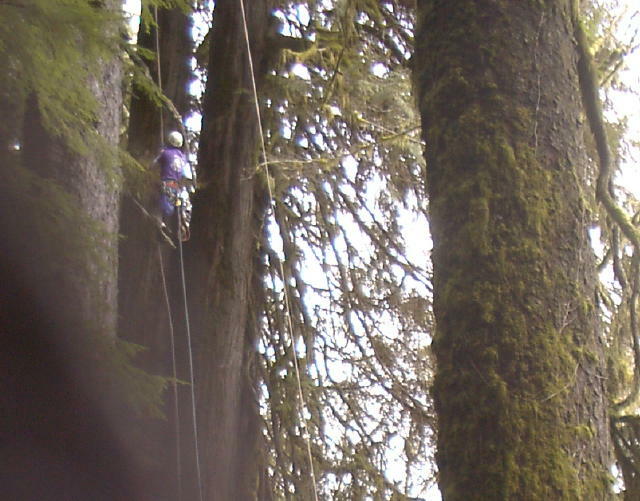 It is an essential skill in pioneering an ascent in big wood like this. A way must be found to get a rope above the obstacle, since it is too big to grab onto. It's a relatively simple operation to then bypass it by climbing the rope.